By all accounts, the all-new 2018 Expedition is set to be one of the biggest improvements ever, over a previous model. 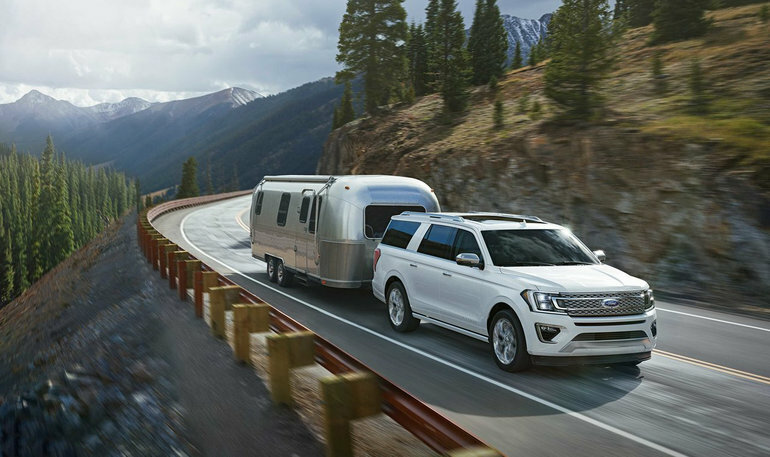 Through innovations under the hood, as well as the frame and overall structure, the news from Ford about this upcoming Expedition has us excited about its arrival. Bartow Ford loves to stock the latest and greatest, so we’re very excited to be getting this delivered to our showroom floor. We can’t wait to be the first Ford dealership near Lakeland to get its hands on one and put it through its paces! Let’s check out what it has to offer. There are a lot of upgrades to the core components of this SUV, starting off with the updated 3.5-liter EcoBoost engine. It is designed for greater fuel efficiency through a feature known as “start/stop” that will shut off the engine when you have stopped at a red light or are otherwise waiting. Although we have no official numbers, this engine has been confirmed to provide more horsepower than its predecessor, which was capable of outputting 365 hp. The transmission is also seeing a significant facelift, transforming from a 6-speed system to a 10-speed automatic system. The Expedition is known for its roominess, and the cabin area is about to get a little bit bigger. It can seat up to eight people, and the third-row seat has more room than ever before, which means all passengers can ride in comfort. The rear seats can also fold down flat, at the push of a button, and can fit large items, including a 4x8 piece of plywood. That means that this SUV will be capable of fulfilling some of the capabilities of a full-size truck! If you’re a techie, you will appreciate the options made available with this new edition. The infotainment system will run your choice of Android Auto or Apple CarPlay, depending on your phone’s operating system. You will also have the option to select a premium sound system, wireless charging, and even Wi-Fi onboard! You can also expect a 360-degree camera system with parking assist and blind spot monitors. We hope you’re just as excited as Bartow Ford to see the new 2018 edition of the Ford Expedition as soon as it debuts! 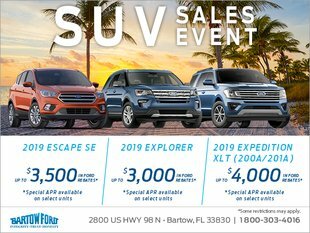 For now, head over to your premiere Ford Lakeland dealership to see which vehicles we have in stock! There are nearly limitless options! We are located on 2800 US 98 North, for your convenience.